Our mobile telescopic cranes meet the latest technical requirements and cover lifting capacities of 30 to 350 tonnes. 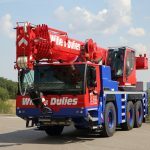 The high competence of our employees is demonstrated when the manoeuvrability is limited due to a small radius of action and especially when using large cranes. Your tasks are our motivation. You have questions or need more information? Feel free to contact us. To read the PDF file you need the Adobe Acrobat Reader. Please click here for the free download.